These Oil DispenserBottles or Cruets are great around the kitchen. You can use them for oil (I have two, one for olive oil and one for vegetable oil), for vinegar and you can also use them at the sink for dish soap. 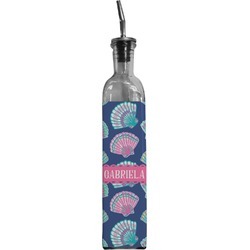 These bottles are eco friendly - they are made in Spain from recycled glass. This bottle holds about approximately 13 oz and has a metal pour spout for controlled pouring. So why have a plain old clear bottle, when you can have a custom bottle that coordinates with your other decor in the kitchen. We have over 300 different prints and pattern and many of our patterns come in over 45 different colors. So create a truly custom and unique design to suit your style. You can put any text on the product that you like. On our sites, you can design it and see what it will look like before you purchase it. Our custom Oil Dispenser Bottles are made by applying a custom printed and cut sticker to the bottle. Our stickers are made from a high quality gloss vinyl and are printed with eco-solvent inks and cut by a machine and thus are completely waterproof and will not fade or deteriorate over time. The sticker covers 3 of the 4 sides. The back is not covered. Love. These would be great as presents. You can change font, color and background. Which they have a ton to choose from.